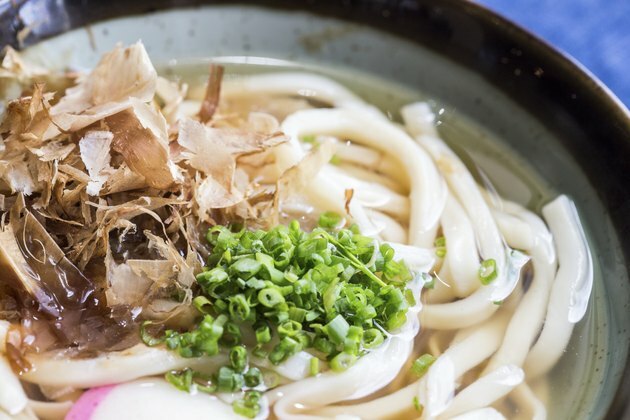 Hailing from Japan, udon noodles typically contain just wheat flour, water and salt. These thick noodles are light on calories, but traditional refined versions are also short on nutrients. For better nutrition, choose whole-wheat noodles instead -- these come packed with vitamins and fiber. Preparation method will also affect the nutrient content of your meal; an udon stir-fry from the mall food court will likely be far more fattening than a homemade dish. A 2-ounce serving of traditional dried udon noodles may contain about 190 calories if you're tracking on a calorie counter. That's less than 10 percent of the needs in a typical 2,000-calorie diet, making this a waistline-friendly food when eaten in moderate portions. Whole-wheat udon noodles are even lighter, containing just 180 calories in the same serving. Both noodles are somewhat better for weight management than traditional spaghetti, which contains about 211 calories per 2 ounces. The healthiest grains are those with high fiber content, as this nutrient aids in digestive function. Unfortunately, regular udon noodles fall flat in this department, containing just 4 percent of the daily value for fiber. Whole-wheat versions, on the other hand, may contain an impressive 20 percent of the DV for fiber. That's because the refined flour used to make traditional noodles has been stripped of the wheat's germ and bran, leaving only the starchy endosperm. The germ and bran contain most of the grain's fiber, which is one reason you lose out nutritionally with refined flours. Another strike against traditional udon noodles: They don't supply significant amounts of any vitamins or minerals. The whole-wheat noodles, however, are a treasure trove of nutrients. Each serving contains 20 percent of the DV for phosphorous, magnesium and thiamin along with 15 percent of the DV for niacin, iron and zinc. It also provides 10 percent of the DV for copper and 4 percent of the DV for folate and riboflavin. Whole-wheat udon noodles also have more protein, providing 16 percent of the DV compared to just 10 percent for the regular noodles. Udon noodles are traditionally served in broth-based soups and stir-fries. While both dishes are potentially healthy, prepared versions may be very high in sodium and fat. A serving of one packaged udon soup, for example, contains 47 percent of the sodium you should have in an entire day. The healthiest option is to prepare your noodles at home using onion, garlic, ginger and other herbs as flavorings instead of seasoning mixes. If you use soy sauce, stick to low-sodium versions. Limit cooking oil to a tablespoon or less for stir-fries, and add lean toppings such as tofu and vegetables instead of fatty beef or pork.